Tilt-Shift is a creative technique whereby a photograph of a life-size location or object is manipulated to give an optical illusion of a photograph of a miniature scale model. Altering the focus of the photography simulates the shallow depth of field normally encountered with macro lenses making the scene seem much smaller than it actually is. 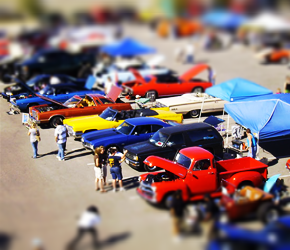 In addition to focus manipulation, the Tilt-Shift effect is improved by increasing color saturation and contrast, to simulate the bright paint often found on scale models. 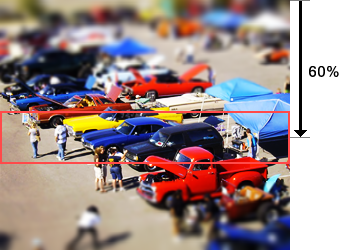 Most faked Tilt-Shift photographs are taken from a high angle to further simulate the effect of looking down on a miniature. The technique is particularly effective on buildings, cars, trains and people. Use this option to change the area in focus. The value is a percentage of the height of the image. Min = 1, Max = 100, Default = 50. This option allows you to change the size of the area in focus. The value is a percentage of the height of the image. Low values give a narrow focus, while large values give a wide focus. Min = 1, Max = 100, Default = 10. This option allows you to specify how quickly the image goes out of focus. Low values result in an abrupt change of focus, while large values make the focus change more gradual. Min = 1, Max = 100, Default = 40. Use this option to enhance color saturation and contrast, to simulate the bright paint often found on scale models.